This is the first book in our U.S.Armored Forces in WWII Series. This series was published originally in 1942 to instruct the greatly expanded Armor branch in the details of tank tactics. 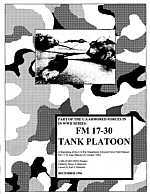 This volume is a reprint of FM 17-30 Tank Platoon (October 1942). It contains hundreds of illustrations of the basic common sense of the do’s and dont’s of armored warfare. Being designed to instruct tens of thousands of new soldiers, it is remarkably clear and down to earth. An excellent book for anyone who wants to learn the basics of tank tactics, especially in World War Two.